Water Damage is a BIG deal for home and business owners. Not only does water cause a lot of a destruction to floors, walls, and ceilings, but extensive water damage can bring several other problems with it, including mold growth, structure damage, and electrical damage. 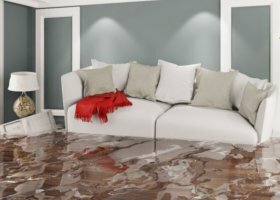 When you are dealing with water damage cleanup in Woodbury or other areas, you want to make sure you are hiring the best of the best professionals who know exactly what to look for, how to make accurate assessments and are trained to put your home or business back together quickly and with the best results. Home and business are two of most peoples’ livelihoods and should be taken seriously and with the utmost caution. Here are a few ways for you to determine if the professionals that you hire are experts at water damage cleanup and the right people for the job. Experience – Does the company you hire have very much experience? How about their team members? Finding a company with a long-standing reputation can make all the difference when it comes to water damage cleanup and restoration. Good companies that perform quality work will be asked to come back time and again. Word of mouth goes a long way. Research the company, read their reviews and testimonials. You might be surprised to find out what other people think of a company’s work performance. Customer Service – Of course quality of work is important, but so is being over-charged for services. Does the company seem to listen to your needs? Are they neglectful of a service you are questioning? Do they answer all your questions? A great water damage cleanup and restoration company wants you to be comfortable with and trusting of them while they are taking care of you and your home. They should address all your needs, explain their processes, and be upfront about costs. If you work with a company that doesn’t do this, find another one. Certifications and Insurance – Professional water damage cleanup and restoration companies of licenses and certifications to prove their training and experience is meeting industry regulations and standards. These certifications are important so that technicians are up to date on the most current processes in water extraction, mold remediation, and safety. It is always wise to ask a company for their licenses and certifications to make sure that any technician or crew member working on your home or business knows what they are doing. If you feel like you are getting the run-around on a project, if you are not being listened to, or if you aren’t getting specific answers on processes and cost, it would probably be best to consider hiring another company. Professional water damage cleanup and restoration companies, like ICC Restoration and Cleaning Services have a strong desire to fulfill the needs of their clients and make them comfortable with the work that is being done to their home or business. Do not let a less than professional company bully you or overcharge you. Get quality work and quality care with water damage cleanup experts in the industry. It is your future that is in their hands.